Krugman's article has the important caveat that we're in a period of substantial excess savings. If that situation were to change then it might be different. Not much sign of that though. That's we call a hell of a bargaining chip. I find it passing strange that (only slightly radical) left agendas are totally out of the question and electoral poison, but seriously radical right wing nonsense like this is fine and dandy. Polly's explanation is great. Particularly loved the "BUGGAH", and the explanation that she got hot and took her overalls off. Those sorts of continuity problems can be really distracting, so glad she didn't try and gloss over it, but addressed it straight away. It may be somewhat traitorous of me to the region and my wife, but I'm going for India today. Isn't it cheating to start a day early? Shame on you India. My glass half empty spouse was worried about the Morkel over with the dot balls, and I said "no problem, as long as Anderson doesn't let it get to him and get out ... ". When he went I thought the chance of victory had gone too. When Dan came out I said to spouse "he scores in an arc of about 20 degrees behind square ..." and what a demented shot that was! Dan you are one cool cucumber! So clearly it is randomised. Can't really understand the gaps though. Odd. The electorate is Palmerston North, the candidates are NZF/Internet/Lab/Nat/Cons. It was as much about the gap as anything. 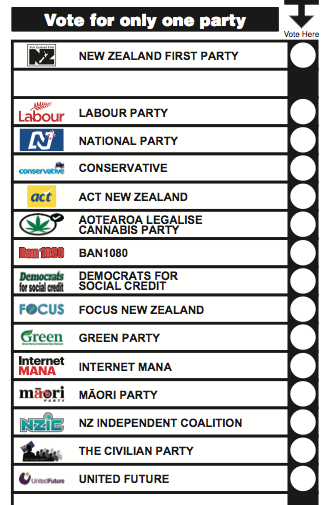 Really makes it a "NZF .. or some other party". This is only peripherally related, but I downloaded my overseas voting papers (I usually don't vote as I don't want to tell you people how to live your lives, but sometimes an exception has to be made ....) and they seemed odd to me. NZF was all alone up the top, with a gap between it and the rest.